Hammer Gorem is the next evolution of Gorem. It is a stronger more powerful evolution with an impressive coat of armor and bull-like horns protruding from its head. Hammer Gorem wields a highly destructive double-sided hammer to pound its enemies into the ground. 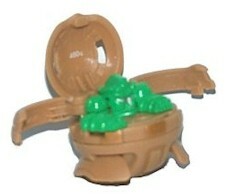 It is a medium/powerful bakugan with with different abilities. Purchase Hammer Gorem from Amazon now!